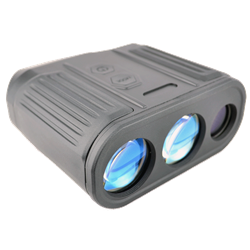 LUNA OPTICS is introducing brand-new Laser Rangefinder Monocular with 2000m (2180yds) measuring distance in a compact and lightweight design. LD-LRF2000M features 8x image magnification with 25mm fully multicoated lens for comfortable viewing during any daylight conditions. Unit operates on one 3V Lithium battery (CR123 type commonly available in stores) and offers a convenient built-in tripod mount.